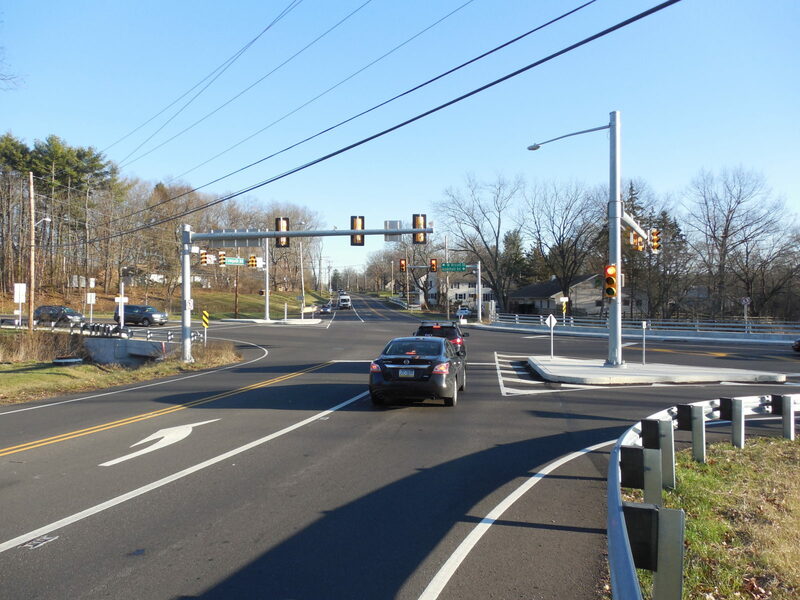 SAI performed preliminary engineering and final roadway design to eliminate two closely paired “T” intersections and provide a single, new, signalized intersection for the SR 1012BCG Cowpath, Godshall, and West Broad Street intersections. Work included heavy public involvement, replacement of two structures, new turning lanes, construction of a sidewalk, and the addition of ADA ramps. Reconfiguration and reconstruction of approximately 2560′ of two-lane urban collector with an ADT of 11,438. 24′ single-span cast-in-place reinforced concrete box culvert over Skippack Creek. 12′ single-cell cast-in-place box culvert over unnamed tributary to Skippack Creek. “Right-Sizing” the preliminary design, which was started by another consultant, using Smart Transportation criteria to improve the geometry, lane/shoulder widths, and structure designs to better fit the site, satisfy hydraulic requirements, and reduce the project footprint. The revision resulted in a cost savings of over $1.5M from original estimates. Multiple curved alignments on all four legs of intersection. Installation of a four-phase, fully-actuated signal including radar detection, emergency vehicle pre-emption, pedestrian signals, and ADA accommodations. Acquisition of right-of-way from 16 properties and presentation of the project at a public meeting with more than 150 local citizens and media in attendance. Coordination with the Township to ensure new signal equipment was compatible with existing systems. Construction of a riparian buffer, rain garden, infiltration channels, and sidewalk curb drains to meet stormwater management requirements. Acquisition of an NPDES Permit for construction activities. Coordination with multiple utility owners to relocate water, sewer, and overhead electric, telecom, and fiber-optic lines and poles. Offline work completed with maintaining traffic on existing roads; detour utilized to complete construction and final tie-ins.